I'm not sure if this prompt is referring to something specific, but it inspired me to draw my dogs... on blue paper. Mari (large M) and Momo (little m). Becky Allen says: Mari and Momo!! Very cute, Eliza! :D	~ Reply? Jenny S. says: I left it vague on purpose; my boys just got Wuggle puppies and named them Cutie and Sweetie. 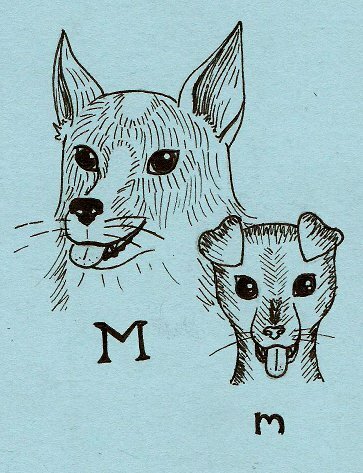 :) This is cute; looks like a page from an alphabet book! :)	~ Reply? Alisha Christian says: They are soooo cute! ~ Reply?